As soon as it was established in 1965, the Omni La Costa Resort & Spa captivated luminous and dignified visitors to play the courses and courts, and to relax at what was the first American resort to offer a full-service spa. Affording 400 unspoiled acres of Southern Californian coastal foothills, Omni La Costa is blessed with natural advantages boasting an expansively beautiful setting. The acclaimed "La Costa Lifestyle" distinguished the resort and defined a new standard of a luxury vacations, one where guest well-being was at the heart of the resort experience. A $50 million renovation has turned Omni La Costa Resort & Spa into nothing short of a nature-inspired sanctuary, meticulously and stylishly fitted with redesigned guestrooms, facilities, and grounds. 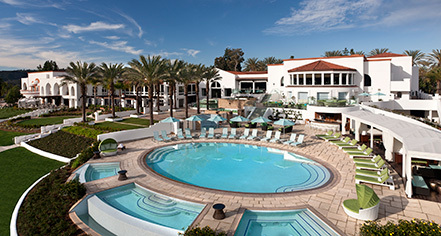 Long a retreat for wellness seekers, The Spa at La Costa, has recently been named the No. 1 Wellness Spa in the nation by Spa Magazine, and Travel + Leisure’s No. 4 Spa in North America. Omni La Costa Resort, a member of Historic Hotels Worldwide since 2014, dates back to 1965. Omni La Costa has hosted the PGA Tour of Champions twice, in 1969 and 1998, bringing great names including Arnold Palmer, Bobby Nichols, Phil Mickelson, and Tiger Woods. Airport Transportation: An airport shuttle may be arranged through the hotel's concierge, rates apply starting at $135 per vehicle. Deposit: A deposit of the first night’s room/package rate and tax will be taken 72 hours prior to your arrival. Early Check-In/Late Check-Out: Early check-in: If you arrive prior to 4:00 p.m., you may check your luggage with the bell desk and enjoy our restaurants, golf courses, resort shops and pool areas until your room becomes available. Late check-out: Based on availability on the day of your departure. Depending on the time you requested for check-out, there might be a late check-out fee, which varies from a half-day rate to a full-day rate. Hotel/Resort Fees & Taxes: The daily resort charge of $35 per room will be added to the daily room rate. This resort charge allows guests to enjoy many resort services and activities without having to incur miscellaneous charges. Services include: In-room high speed WiFi, WiFi hot spots, access to our state-of-the-art Athletic Club, no charge for local and 800 access calls, in-room coffee and tea, and daily newspaper (upon request). Parking: Self-parking: Available; $24 per night. Valet parking: Available; $34 per night. Payment: All forms of payment are accepted. Visa, MasterCard, Amex, Discover, and Diners Club International are accepted. Pet Policy: Service animals allowed: Yes. Pets allowed: Yes. Dog-friendly. Restrictions: Dogs Only. Maximum weight: 25 lbs. Fees: $150 (nonrefundable cleaning per stay per room). Other: Extreme or wild animals are not authorized. Service animals for blind or otherwise disabled are exempt from fee and weight limit..
Rollaways: Available upon request; $25. Smoking Policy: There is no smoking in guest rooms. Smoking is prohibited on pool decks, restaurants and in all our shops. Guest may smoke in most other outdoor areas with the exception of the Spa Courtyard. Transportation: Limo or town car service may be arranged through the hotel’s concierge. Rates apply. As soon as it was established in 1965, the Omni La Costa Resort & Spa captivated luminous and dignified visitors to play the courses and courts, and to relax at what was the first American resort to offer a full-service spa. 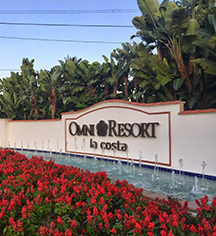 Learn more about the History of Omni La Costa Resort & Spa .